And yes, before you ask, this will probably make its way to NA soon. It was inevitable that another weird jungle build would pop up in the Korean solo queue meta. After all, it’s been a few months since jungle Ezreal first revealed itself, so the bill was nearly due. 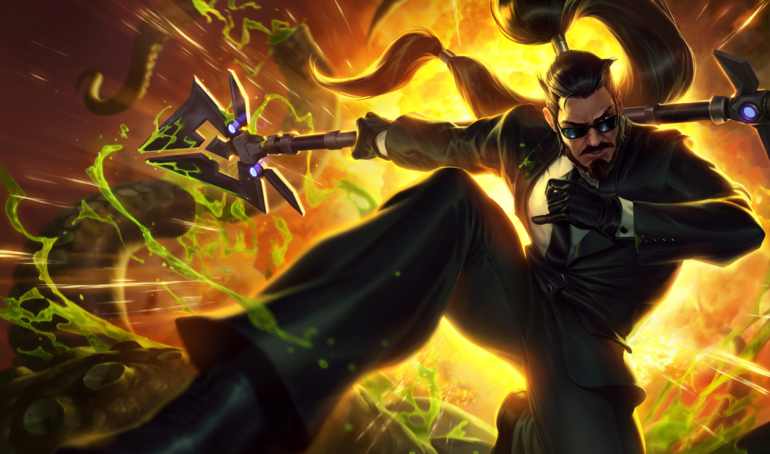 This time, it’s crit-strike Xin Zhao, and it’s just as terrifying as it sounds. Xin has been one of Korea’s best junglers for a few months, according to League of Legends stats site OP.gg. That’s not terribly surprising, considering he’s also been crushing solo queue in both Europe and North America, too. The full-crit build is still unique to the South Korean server, however. Before you start condemning it, or worse, immediately insta-locking it in ranked queues, here’s why it works—and why sometimes it’s still better to choose the tried-and-true bruiser build. For starters, critical strikes work really well with Xin Zhao’s passive ability, which boosts the damage of every third basic attack. This boost applies to crits, which means, you can critically strike, and then get your bonus AD proc on top of it. Simply put, this means you can blow up squishy targets with one crit, and then amplifying that with the Statikk Shiv proc and Infinity Edge crit boost makes it even worse for your victims. With this build, you’ll start noticing that you can plow through squishy champions in about four to five basic attacks with only your Warrior Enchantment and the Statikk Shiv. When you add the Infinity Edge into the mix, you’re down to about two or three hits. If you get a decent lead of only one or two kills early on, you can turn that into an oppressive snowball that never lets an ADC come back into the game. This build also synergizes extremely well with Press the Attack. If your third basic attack (the one that triggers Press the Attack) is also your third Talon Strike, you’ll knock the target into the air, giving you more time deal beefed-up damage from the rune. This build works like a dream on teams with only one tank, and even better against less. Unfortunately, the more peel the enemy team has, the worse this build becomes, because it’s squishier than a pile of Jell-O. With this build, you have to be able to walk close enough to a carry so that you’re in range of your dash, and then you need time to land a few basic attacks. If there’s any crowd control or peel from a tank, you’ll probably be dead before you even get to them. You’ll struggle if your team lacks tanks, also. This isn’t because Xin is more optimized to be tankier, it’s just because there aren’t any other bodies on your team to distract the enemy long enough for you to attack without taking the damage yourself. In both of those cases, you’ll probably want to go the familiar route of Trinity Force into tanky items. If you find yourself in the right circumstance, however, the crit build can stamp out the enemy team’s hopes of winning very quickly. It certainly isn’t OP in any way, but when it actually works, it works very well. If you’re a practiced jungler, and you spot the right opportunity to try out this build, go for it, because it’s extremely fun. If you’re not, though, or you want to just take it into solo queue without a moment’s thought, please hear us out. On behalf of any teammate you might pair up with—don’t. Please, for the love of League, just don’t.